This is a quick project to crochet and is rated as easy. The pattern is free from the Caron website. I am making these as prayer shawl’s for a ministry at my church. The original pattern uses Caron Simply Soft (24 oz.) and a H hook. The finished size is 25″ x 68″ . I used baby sport “Snuggly Wuggly” by Loops and Treads (2 skeins) in cobalt, purchased from Michaels, and a E hook. My shawl measures 19″ x 52“. It could be made longer by adding additional rows. 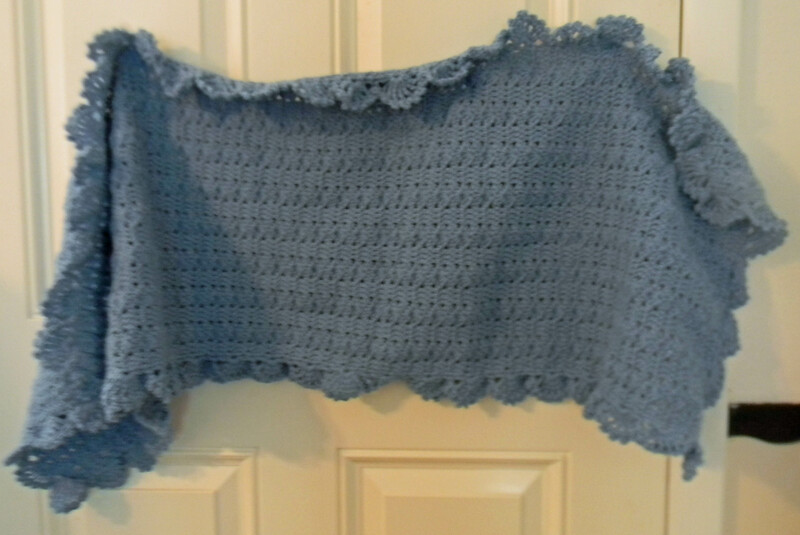 This entry was posted in Crafts, Crochet, Posts and tagged Crochet, crochet shawl, free shawl pattern, shawl. Bookmark the permalink. I would love to make this shawl for my ministry but Caron no longer has it free! Can you send me the pattern?